Size: * 5 lb. 15 lb. 30 lb. 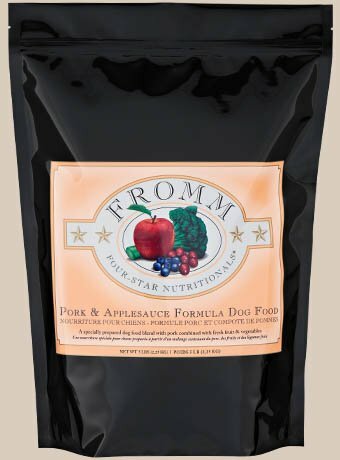 Pork, Pork Meat Meal, Oatmeal,Pearled Barley, Pea Protein, Brown Rice, White Rice, Dried Tomato Pomace, Dried Whole Egg, Sweet Potatoes, Pork Fat, Potatoes, Chicken,Applesauce, Cheese, Salmon Oil,Flaxseed, Carrots, Broccoli,Cauliflower, Green Beans, Chicken Cartilage, Potassium Chloride,Cranberries, Blueberries, Salt, Chicory Root Extract, Alfalfa Sprouts, Yucca Schidigera Extract, Sodium Selenite,Folic Acid, Taurine, Parsley, Sorbic Acid (Preservative), Vitamins,Minerals, Probiotics.